Ovations new nylon-string 1773AX acoustic-electric is the latest addition to the Pro Series line. Ovation's cutting-edge design and innovation has kept them at the forefront of acoustic and acoustic-electric guitar building. This mid-depth body model offers complete fretboard access and is perfect for jazz, Latin, flamenco or classical guitar players looking for balanced tone and exceptional plugged-in performance. The neck is slightly narrower than on a standard classical guitar, making this Ovation ideal for the steel-string player desiring to explore new territory. Includes case. Start putting those fingernails to work. Order now! This Ovation CE is very impressive in all aspects. No negataive issues have been encountered. However, just a word about stability. If the rounded back presents somewhat of a challenge, consider using a strap. As is rather consistent with Ovation guitars, the sound level may initially seem low in the "unplugged" mode, but the sweet tone quality more than compenstes for this feature. .The action is way to high out of the box. It cost me another 100 to get the action lowered. I hate the slippery back which will not allow you to get in a classical guitar pose to play. The electronics are superb though. My much cheaper Cordoba sounds and plays better than this guitar. Save yourself some money and get it. 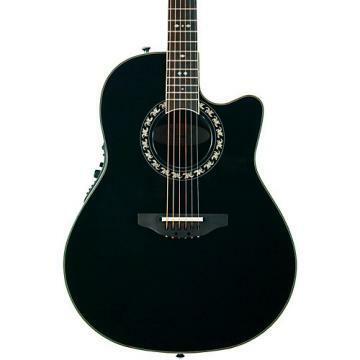 .Great guitar at a great price! .This guitar is special. I had the previous model from 1995 and it had a great and flexible sound, mostly plugged. I am a left handed guitar and decided to convert it to left. Waiting for Ovation to bring one for us!! .Instrument arrived without documentation for use of controls, including tuner. Card enclosed was for Ovation "Celebrity" line guitars, not for the 1773AX-4. Fingerboard was said to be "ebony", but this is doubtful from its appearance. Notably missing is information on how to adjust action, since the action is high and the bridge is rather strange-looking for a "classical" guitar. It is also rather peculiar that the tuner needs a 9-volt (!) battery.